Welcome to Bellevue Auto Body Shop! As our customer, we welcome you to our Web Site. Since 1961, Bellevue Body Shop has been serving the Green Bay area and surrounding communities, with the finest quality repairs available. These repairs are made possible through our continued dedication to the collision repair industry. We are Working to keep our shop equipped with the technology needed to repair today’s complex vehicles. As a member of the Green Bay business community, we adhere to a Code of Ethics, our pledge to you of honesty, integrity, safety, and craftsmanship. You may have some questions concerning the estimating and repair process. If you do please ask us. We are ready and willing to help you in any way we can. For us, satisfying our customers is the most important goal we have. Again, thanks for visiting our Web Site. Please visit our other pages for more information. Dedicated to improving the collision repair industry, locally in the Green Bay Area, statewide and nationally, by being actively involved in issues concerning auto collision repairs. Providing low cost rentals and loaner cars for our customers, while their vehicle is in for repairs. We make every effort to minimize customer out of pocket expenses. 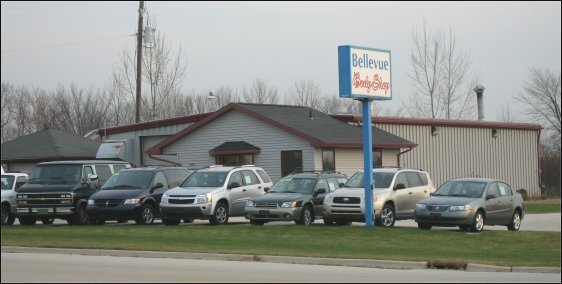 Bellevue Body Shop has also been selling used vehicles. We specialize in low mileage late model cars and trucks. These units are purchased at auction from lease returns, rental companies and dealer trade ins. Call or visit our lot on the east side of Green Bay to see what we have to offer. We can also do special purchases for you. Let us shop for the vehicle you’ve always wanted.